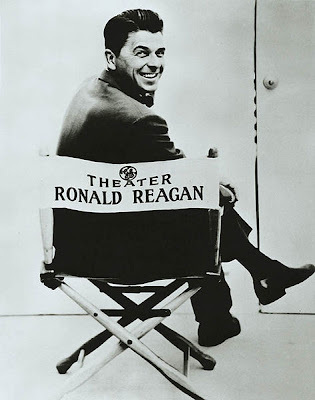 Center stage: Ronald Reagan on the set at the General Electric Theater, 1954-62. Photo from Wikimedia Commons. The Reagan era brought us depression, war, and mass murder in the Global South. The right wing media have resumed the historical revisionism that portrays Ronald Reagan as a great president. The occasion for this is the 100th anniversary of President Reagan’s birth. He is being trotted out by Republicans and Tea Party spokespersons to celebrate the political life of “the great communicator,” the savior of America. Let us be clear: the policies and programs instituted in the 1980s that led to 30 years of economic decline at home, dramatic increases in military spending, and massive killing of peoples of color in the Global South, have their roots in the demands of economic and political elites before President Reagan assumed office. In addition, the disastrous 30 years of public policy was created with the willful collaboration of powerful figures in both political parties and a political economy that makes such pain and suffering likely. However, the Reagan era (preceded by the rise to power of Reagan’s mentor, Margaret Thatcher, prime minister in Great Britain) can be seen as introducing a qualitative shift in public policy from state and market collaboration as exemplified by the New Deal (1932-1976) to the celebration of the market as a source of economic well-being and political stability. While government grew enormously during the last 30 years, the official ideology was used by Republicans and Democrats alike to reduce or eliminate government programs that were targeted to assist the vast majority of the people, the working class. Looking at economic policy, the Reagan administration launched a campaign to destroy the U.S. labor movement, reduce rudimentary public services and supports for the poor (President Clinton finished the job), radically reduce corporate taxes, provide tax incentives to encourage manufacturers to move plants overseas, and expand the deregulation of banking and financial speculation (begun by President Carter). The impacts of these policies included reducing the rights and living conditions of workers, resuming the historic process of shifting the wealth and income of the country to the top one percent of the economic elite, reducing the middle class, and increasing the percentage of the people living below the poverty line. While the proportion of the society’s wealth controlled by the economic ruling class grew, the rate of economic growth of the economy as a whole since Reagan declined by one third compared to the period from the 1940s through the 1960s. Reagan’s global economic policies, commonly referred to as “neoliberalism,” used debt, induced by the IMF and private banks, and military power to force virtually every country in the world to cut back on public services to their citizens, privatize their economies, shift from producing goods and services for their own people to producing for exports (to earn foreign exchange so that they could pay back western banks that forced them to borrow billions of dollars). As the economic vulnerability of workers grew in poor countries, they became desperate, pliant, and cheap labor was forced to manufacture goods for 10 percent of the wage costs of workers in the United States. By 2000, half the world earned $2 a day or less. In the United States, wages stagnated; earnings at the dawn of the new century in real dollars were no higher than the early 1970s. Also, the Reagan administration of the 1980s increased war-making and complicity in the deaths of millions of people around the world. As a candidate, Ronald Reagan convinced many Americans that a “window of vulnerability” had opened in America’s security posture because of the escalation of military spending by “the evil empire,” the former Soviet Union. As president, Reagan launched the biggest arms buildup, aside from World War II, in United States history. And, as was the case in 1960 when candidate John F. Kennedy campaigned with claims of a “missile gap” between the United States and the Soviet Union, the claim was a lie. Hamstrung by the post-Vietnam fear Americans held about the U.S. getting involved in another quagmire, what beltway policy wonks called “the Vietnam Syndrome,” Reagan defense intellectuals shifted to what they called “low-intensity conflict.” LIC meant that the United States would fund anti-communists, reactionaries, and militarists who would fight our wars for us. The United States funded anti-government rebels in Nicaragua, Angola, Ethiopia, Cambodia, and Afghanistan, including followers of Osama Bin Laden. Arms sales to right-wing regimes, such as those in El Salvador, Egypt, Saudi Arabia, Israel, and Pakistan, skyrocketed as Reagan lifted Carter administration sales limitations. Conservatively 2 million people in Latin America, Africa, Asia, and the Middle East died because of these policies. Given the Reagan public discourse concerning “evil empires,” threats that the Soviets had better give up their system or expect war, and the new military doctrines, the world was lucky to survive the 1980s without nuclear war. With the collapse of the Soviet Union, some of the threats to human survival waned but the neoliberal global agenda continued through the first Bush presidency and the Clinton years. The global military agenda resumed in the new century as the creators of the Reagan era military programs assumed positions of power in the Bush administration. The Rumsfelds, Cheneys, and their subordinates, who gained experience back in the Nixon days and became foreign and military policy influentials in the Reagan (and George H.W. Bush) periods, and who had organized out of power in the Clinton period, were back in the saddle. They used the 9/11 tragedy to project military power on a global basis. 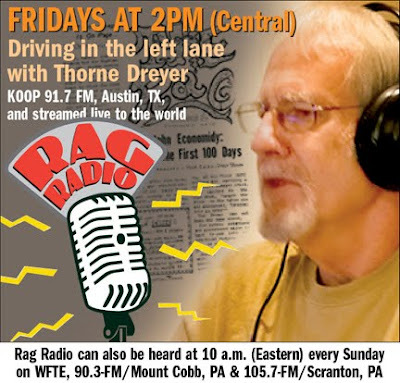 So when hometown papers publish articles with headlines like “ ‘Great Communicator’ Still Resonates” (Journal and Courier, Monday, January 31, 2011) be prepared to remind people what really happened in the 1980s and that the public policies adopted then have caused so much pain ever since. Probably some of these newspapers will continue to expand their revisionist project in other subject areas as well; for example, suggesting that the Founding Fathers opposed slavery in the United States.